Observation fields are a way to add extra details to any observation. For example, if you've got a butterfly observation, you can add the observation field "insect lifestage" and set it to "adult". If you photographed a caterpillar of the same species, you could set the "insect lifestage" field to "larva". This adds extra value to observations. That's because it makes these details much easier for researchers to find and use than if they were written down in lots of different ways in paragraphs in the observations' descriptions. For example, insect lifestage lets researchers quickly figure out at what time of year adult butterflies are flying, since they can quickly separate observations of adults from observations of eggs, larvae, and pupae. For all fields in iNaturalist NZ — Mātaki Taiao (and the global iNaturalist network), see https://inaturalist.nz/observation_fields/. Any of these fields can also be added to Projects as required or recommended fields for people to fill in. This is a great way to add value to the observations in a project. If you cannot find the field you need, you can create it. Any field you create will be available to everyone across iNaturalist NZ — Mātaki Taiao and the whole iNaturalist Network. If you do create a new field, please take the time first to ensure that a field doesn't already exist with the same function. 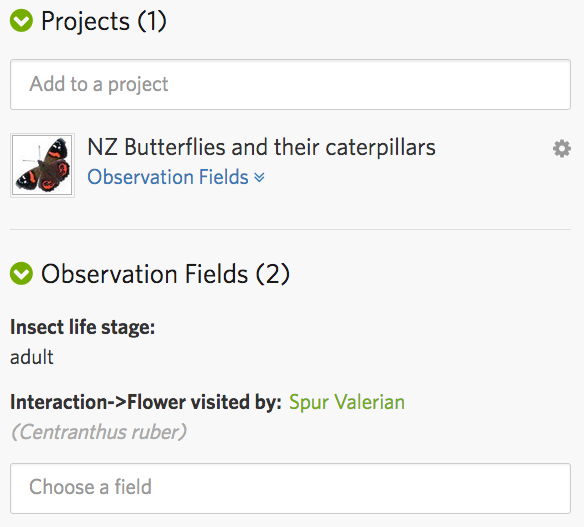 You can search all of the existing fields at https://inaturalist.nz/observation_fields/. Observation fields work best when everyone uses the same one field for a particular purpose. With that in mind, we list here our favourite fields that are commonly used throughout iNaturalist NZ. For how long did you search? What did you look for? How many did you find? Your name will automatically be added to your observation. However, sometimes you may also want to add names of other observers. Original observer If you're not the person who originally made this observation, you can add their name in this field. Photographer If you didn't take the photo, you can add the name of the photographer in this field. Additional observers You can list the names of the people with you when you made the observation. Number of observers If the number of observers is an important measure of collection effort for your project, you can include it with this field. Substrate refers to the kind of thing a species is growing on. The weather conditions can influence what species you find. The following are the standard weather fields used in NZ 5-minute bird counts. Nature is filled with species interacting with other species. These interactions are often poorly documented (what eats what, what pollinates what, etc.) so it's really helpful to add these fields to observations of species interacting. It's best to add each appropriate interaction to an observation using the relevant field starting with "Interaction->". You can also add the link to another observation using the "associated observation" field. Trap Types The NZ standard trap types for mammalian pest control trap monitoring. Other Trap Type This is the specified other trap type in the NZ standard trap types for mammalian pest control trap monitoring. Trap Bait Type The NZ standard trap bait types for mammalian pest control pest trap monitoring. Other trap bait type This is the specified other trap bait type in the NZ standard trap bait types for mammalian pest control trap monitoring. Trap status The NZ standard trap status for mammalian pest control pest trap monitoring. Bait Station target species The NZ standard bait station target species for mammalian pest control bait station monitoring. Other bait station target species This is the specified other bait station target species in the NZ standard trap bait types for mammalian pest control trap monitoring. Bait formulation The NZ standard bait formulation for mammalian pest control bait station monitoring. Other bait formulation This is the specified other bait formulation in the NZ standard trap bait types for mammalian pest control trap monitoring. Bait Station Type The NZ standard bait station type for mammalian pest control bait station monitoring. Other Bait Station Type This is the specified other bait station type in the NZ standard trap bait types for mammalian pest control trap monitoring. Bait active ingredient The NZ standard bait active ingredients for mammalian pest control bait station monitoring. Other bait active ingredient This is the specified other bait active ingredient in the NZ standard trap bait types for mammalian pest control trap monitoring. These fields are for people good with names. Many NZ species don't have scientific names yet. Taxonomists say that species without formal names and scientific descriptions are "undescribed". Some are easily recognised and expected to be real species when the taxonomic work is done. These are given "tag names" in the mean time. To make observations of probable species with tag names, you can use the following two fields. tag name to keep track of undescribed taxa. Give your ID in iNaturalist NZ — Mātaki Taiao as the genus and add the tag name into this field, e.g., the orchid Pterostylis "Bluff". aff. scientific name (tag name) Use this for a likely undescribed species that experts say has an affinity to, but is not identical to, a described species, e.g., Spiranthes aff. novae-zelandiae ("Motutangi"). Deformity/abnormality abnormal growth form (mutations, melanistic, leucistic, albino etc). Injury/Anomaly atypical physical difference (injury, gall, tumour/growth, witches' broom, fascination). In general, good photos are all you need. Sometimes, however, a specimen needs to be collected. Sometimes a professional taxonomist will comment on one of your observations and work with you to get a specimen vouchered in a collection. These vouchered specimens get unique specimen numbers and it's very helpful to add these numbers to their associated observations. Keep in mind that you'll need access to a research permit to collect anything from Department of Conservation managed land and water. CHR (Allan Herbarium) number The voucher specimen accession number if a specimen of this exact individual plant has been lodged in the Allan Herbarium at Manaaki Whenua/Landcare Research, Lincoln, New Zealand. PDD voucher number Voucher number of the associated specimen housed in the New Zealand Fungal & Plant Disease Collection at Manaaki Whenua - Landcare Research. AK (Auckland Museum Herbarium) Number The voucher specimen number if a specimen of this exact individual plant has been lodged in the Auckland Herbarium at the Auckland Museum. MA (Auckland Museum Marine Department) Number The specimen has been lodged with Auckland Museum Marine Department. Collection institution If you collected a specimen, please provide the name of the collection in which the specimen was deposited, e.g. "Jepson Herbarium". Voucher Number(s) The unique voucher ID from an institution's specimen collection. Personal voucher number The ID number in a personal collection of preserved specimens.